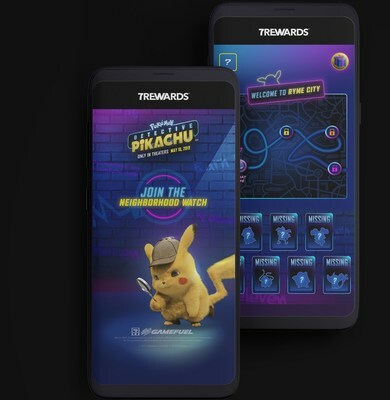 IRVING, Texas, April 17, 2019 /PRNewswire/ -- 7-Eleven® stores are teasing the highly anticipated theatrical release of the first-ever live-action Pokémon adventure, "POKÉMON Detective Pikachu," with dozens of exclusive movie-themed products, shareable photo filters and interactive augmented reality (AR) experiences in the 7-Eleven app. For a limited time that includes the film's May 10th nationwide release date, the world's largest convenience retailer is also offering dollar drink deals to introduce its new mocha beverages and mystery-flavored Slurpee® drink. A small cup of the new hot mocha, medium Cold Brew or medium Slurpee drink each cost only $1 at participating stores. "'POKÉMON Detective Pikachu' is a great entertainment tie-in for 7-Eleven because it appeals to so many of our customers – kids, Gen Z, millennials," said Tarang Sethia, 7‑Eleven vice president of digital customer experience. "Millennials, who played the original videogame 20 years ago, are parents now and can enjoy the Pokémon phenomenon all over again with their kids. The entire Pokémon franchise launched as a videogame, making it the perfect vehicle to create experiences that maximize the new and growing AR capabilities in the 7-Eleven app." Along with the unique and exciting AR games, "POKÉMON Detective Pikachu" products will be available at participating 7-Eleven stores and can be delivered in select areas through 7NOW™, the retailer's delivery platform. Every Thursday during the promotion, 7-Eleven will unveil a free signature item that fans can order and have delivered directly to a chosen location. 7-Eleven has created a Ryme City Neighborhood Watch AR experience in its app, named for the movie's fictional setting, that includes a new "Find the Missing Pokémon" activity each week. Drawing from the movie storyline, each activity will fully immerse users in a unique story to find the missing Pokémon. The quest to successfully find each Pokémon unlocks exclusive offers for free products. The free offers, in the order they can be earned, include a free pizza slice, four free mini tacos, free any-size cup of Hi-Hat Mocha or other hot beverage, and five free chicken wings. A variety of 7Rewards bonus point offers run throughout the "POKÉMON Detective Pikachu" promotion, and selfie snaps also earn 7Rewards points weekly when customers share via their social channels using the hashtag #7ElevenNHW. Since 7-Eleven launched AR last year, customers have been seeking out its stores to play games or meet a surprise celebrity, character or athlete. The Mystery Slurpee Sweepstakes offers customers an opportunity to do a little sleuthing for a chance to win a year of FREE Slurpee drinks. The Instagram-based contest invites users to follow Slurpee on Instagram; post a photo, video or gif of themselves; guess the three flavors in the Mystery Slurpee drink; and include the required hashtags, #MysterySlurpee and #Sweepstakes in the caption. Detective Pikachu really, really loves coffee. 7-Eleven customers love coffee a lot too – it's the retailer's No. 1-selling product. Named for a café featured prominently in the movie, the new Hi-Hat Mocha hot beverage blends a rich balance of chocolate and coffee flavors with steamed milk and is topped with frothy foam. In select stores, customers can add a pump of chocolate sauce or yellow and white sprinkles. 7-Eleven also carries a rich, chocolatey Mocha Cold Brew coffee drink. 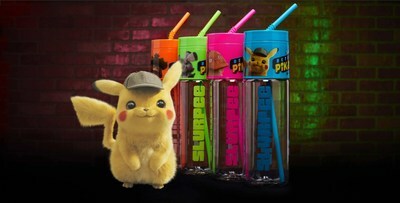 Colorful, limited-edition Slurpee bottles and straws feature Detective Pikachu and other movie characters – Psyduck, Ludicolo and Snubbull. Refillable, insulated coffee mugs also feature Detective Pikachu, Psyduck and Ludicolo. Participating 7-Eleven stores will have a variety of Detective Pikachu merchandise for all ages, including an exclusive set of trading cards, trading card file, plush Pokémon characters, Pokémon Clip and Carry Pokéball belt and Pokéballs. Moviegoers can visit their local movie theater opening weekend decked out in Ryme City wear to see Pokémon Detective Pikachu. Available in select 7-Eleven stores and online at https://www.amazon.com/7-eleven are Ryme City T-shirts, Hi-Hat Café and Detective Pikachu hats, wallets and key chains. 7-Eleven also created three 7-Select® private brand chocolate bars to tie in to the movie. The "POKÉMON Detective Pikachu" bar flavors are Bolt'n Banana Milk Chocolate, Roaring Raspberry Confection and Psyched-up Orange Milk Chocolate. The bars are available at participating stores while supplies last. Other "POKÉMON Detective Pikachu" sweet treats include a Create-a-Cookie Kit, vanilla cupcakes with yellow icing and sprinkles, as well as Pillsbury ready-to-bake cookies. "POKÉMON Detective Pikachu" stars Ryan Reynolds as Pikachu, the iconic face of the global Pokémon phenomenon—one of the world's most popular, multi-generation entertainment properties and one of the most successful media franchises of all time. Fans everywhere can now experience a Pikachu on the big screen as never before, as Detective Pikachu, a Pokémon like no other. The film also showcases a wide array of beloved Pokémon, each with its own unique traits and personality. When ace detective Harry Goodman goes mysteriously missing, his son Tim wants to find out what happened. Aiding in the investigation is Harry's former Pokémon partner, Detective Pikachu: a hilariously wise-cracking, adorable super-sleuth who is a puzzlement even to himself. Finding that they are uniquely equipped to work together, as Tim is the only human who can talk with Detective Pikachu, they join forces on a thrilling adventure to unravel the tangled mystery. Chasing clues together through the neon-lit streets of Ryme City—a sprawling, modern metropolis where humans and Pokémon live side by side in a hyper-realistic live-action world—they encounter a diverse cast of Pokémon and uncover a shocking plot that could destroy this peaceful co-existence and threaten the whole Pokémon universe. "POKÉMON Detective Pikachu" also stars Justice Smith, Kathryn Newton, Suki Waterhouse, Omar Chaparro, Chris Geere, Rita Ora, with Ken Watanabe and Bill Nighy. The film is directed by Rob Letterman, from a screenplay by Dan Hernandez & Benji Samit and Rob Letterman and Derek Connolly, story by Dan Hernandez & Benji Samit and Nicole Perlman, based on the "Detective Pikachu" video game developed by Creatures Inc. It is produced by Mary Parent, Cale Boyter, Hidenaga Katakami and Don McGowan; with executive producers Joe Caracciolo, Jr., Ali Mendes, Tsunekazu Ishihara, Kenji Okubo, Toshio Miyahara, Hiro Matsuoka, Koji Ueda. Music is by Henry Jackman. Warner Bros. Pictures and Legendary Pictures present a Legendary Pictures Production in association with Toho Co., Ltd, a Rob Letterman Film. It will be distributed outside of Japan and China by Warner Bros. Pictures, in Japan by Toho Co., Ltd. and by Legendary East in China. Rated PG. 7-Eleven, Inc. is the premier name and largest chain in the convenience-retailing industry. Based in Irving, Texas, 7-Eleven operates, franchises and/or licenses more than 68,000 stores in 17 countries, including 11,800 in North America. Known for its iconic brands such as Slurpee®, Big Bite® and Big Gulp®, 7-Eleven has expanded into high-quality salads, side dishes, cut fruit and protein boxes, as well as pizza, chicken wings, cheeseburgers and hot chicken sandwiches. 7-Eleven offers customers industry-leading private brand products under the 7-Select® brand including healthy options, decadent treats and everyday favorites, at an outstanding value. Customers also count on 7-Eleven for bill payments, self-service lockers and other convenient services. Find out more online at www.7-Eleven.com, via the 7Rewards® customer loyalty platform on the 7-Eleven mobile app, or on social media at Facebook, Twitter and Instagram.